Tempest is currently the strongest ranged DPS spec in the game by a fairly significant amount. A lot of people despise Tempest due to it feeling like a very ‘clunky’ and ‘over-complicated’ build when first playing about with all the abilities that Tempest has, however with the help and guidance of my friend Scurch@Gelidra, we’ve simplified the single target rotation into 3 very simple and smooth flowing macro’s, which time all the cooldowns almost perfectly, with this guide, you should be able to pick up Tempest and master it in under 20 minutes. False Repose (Or feign death as I like to call it) gives the Tempest an instant way to drop all their threat immediately and occasionally save money on soul mending! -You’ll want to use Focus Fire off cooldown the majority of the time, but on some fights (Proteus, Magma Lord Kaliban) it’s a good idea to save it for burst phases to time it with Flaring Power etc. If you’re lazy tho, you can just add it to macro 1. -Before a fight you can face away from any mobs and channel ‘Storm Torrent’ to build 3 attack points. The spec itself is fairly straightforward, 61 points in Tempest and then the remaining 15 points in Riftblade for increased damage on your non-physical abilities and also Storm Blade, the remaining 0 point soul is then Paragon for way of the River which grants the Warrior a 3% increased crit chance. Start with 3 AP (As a reminder you can face away from anything harmful and channel Storm Torrent to get 3 AP before you engage your target) or with Lightning Torrent. As a reminder, you’ll want to be within 25m of the boss for Flamepsear to go off, or else you will double cast Electricity Blast, It’s also better to double cast Electricity Blast than cast a Shock Pulse in the place of the second Electricity Blast, due to the fact that Arc will carry over to Skyfall and if you use Shock Pulse, this will consume Arc. Usually you’ll want to use and spam the Wavelength macro whenever it is off CD which will be once every minute, however on some fights where there are periods a boss becomes vulnerable and takes a significant amount of increased damage, for example Proteus or Magma Lord Kaliban, it’s often better to save your Wavelength cooldown for these phases when the DPS is really needed. You’ll notice the Wavelength macro ends with lightning torrent, which will only be triggered after the duration of your wavelength has finished, while Wavelength is up the macro essentially spams Charged Pulse and Double Pulse, so once you run your Wavelength ends you’ll hard cast a Charged Pulse and Double pulse, followed by a skyfall and then finally followed by lightning torrent, once you’ve finished channeling lightning torrent, you go to macro 1 or electricity cascade and continue the standard single target rotation. Finally keep in mind that Wavelength is an extremely strong DPS cooldown, so using it straight off the bat in a raid or dungeon environment when engaging a boss may draw unwanted agro. While tempest doesn’t have the strongest AOE of all the warrior callings, it still pulls a fairly moderate amount of AOE damage when needed, but as a reminder if there is a very heavy AoE fight/scenario E.G Matriach of Pestilence or general raid/expert trash your usually better off using a 61 Champion. Unlike the ST rotation, unfortunately the AOE rotation cannot be macro’ed due to the abilities not really having cooldowns, but it is pretty damn straightforward regardless. Storm Torrent -> Chain Pulse -> Electricity Blast -> 2x Offensive Blast -> Chain Pulse -> 3x Offensive Chain Pulse -> Chain Pulse -> Back to Storm Torrent and rinse and repeat! So that is it for the Tempest Guide, any questions, corrections, feedback or additions to this guide please feel free to leave them in the comments below! ← 3.0 Souls confirmed for Patch 2.7! I’m getting lot of tells saying “my” rotation has been stolen or not being credited to the right person. Personally, I don’t really care. Although the rotation is the same I can’t really claim it “mine”, at the same time lots of tweaks and peaks have been made to the rotation, as this one was announced publicly at release of 2.5. A change you might want to add is having Delayed Pulse go off before Dual Pulse on macro 1 that way during Wavelength block Arc will tick from it and not a Charged Pulse. Offensive Blast -> Chain Pulse (1 pt finisher) Then repeat. This will put you back at storm torrent which is way, way more damage than 2 more Offensive Blasts and a three point finisher. There is sometimes about a second delay before storm torrent is up, I just wait it out or I may put another Offensive blast out. Why not place 5 points into Teaching of the 5 Rings or Decimation instead of Affinity to maximize DPS? Am I missing something? 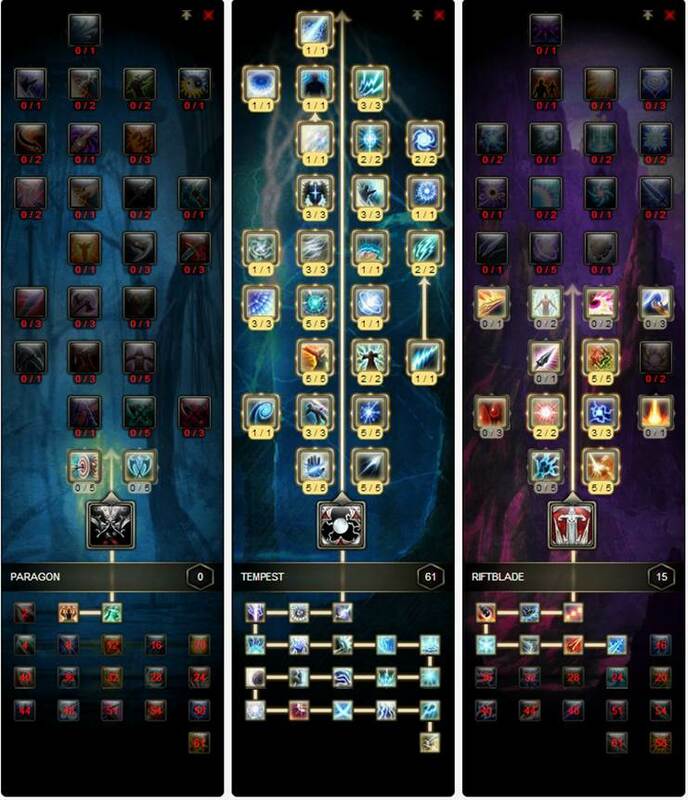 Is there any updates of guides on Tempest/RiftBlade in v2.8 onwards ? Need more insights. Tried many builds but often get thrashed by heavy dps. Anyway to prevent from getting killed often ? Need tips. Thanks.